If you've been off the planet for a few years and want to know what's hot and what's not, simply look through the Subject: lines of the spam that my server deletes daily. 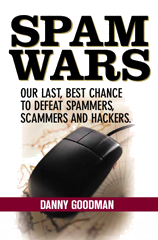 If a spammer claims that he wants to give you something for free, you can be sure that something of value to you (money, privacy, identity, time) will slip out of your reach and into the spammer's pocket. The lure, alas, is irresitable to many. The Apple iPod has been the hot ticket for quite awhile. I've seen several schemes, some of which have a decidedly pyramidal shape to them, and I can't imagine that there haven't been some outright scams, all in the name of iPod. The new portable Sony PlayStation (PSP) may try to eat into the iPod's territory on the free scam playing field, but I mean, who wouldn't want an iPod? Even this grizzled gadget junkie wouldn't give up his iPod for a PSP (and back in the Atari/Intellivision/Odyssey/Coleco days I used to review video games!). I gotta wriggle in silhouette as if fighting off a swarm of bees while sporting white ear buds. Subject: Get the Biography of Pope John Paul II, for Free. Now, who will be the first spammer to offer a free iPod with the papal biography already loaded as a free audio book?